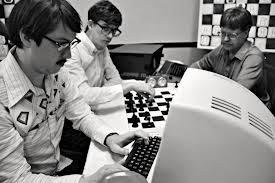 Man, I loved, loved, loved COMPUTER CHESS! Then again, I think I'm its target demographic, if a movie as wilfully indie spirited could trade in such a concept. It's a movie that's geekily indulgent and indulges in the geeky, lovingly recreating a fictionalised computer chess tournament in the early 80s. Director Andrew Bujalski (FUNNY HA HA, THE PUFFY CHAIR) clearly had a lot of fun casting a group of misfits and dressing them in massive 1980s glasses and ill-fitting suits, as well as kitting them out in the sexual and racial mores of the time. But where the real joy comes is in seeing all those old skool clumsy computers and overhead projectors and reels of computer paper. I could almost smell our old high school computer lab. To be fair, the movie doesn't really have a plot. It doesn't really care about which team of brainiacs wins the computer chess tournament, or whether machine will beat computer by 1984. It's all about the observational humour: seeing a nerdy teen propositioned by the swingers also staying at the hotel. Or the well meaning IT professor trying to spin his programme's failure as a win for science. Or the cocky, scene stealing Michael Papageorge begging to be let into anyone's room for the night. Like I said, I am the perfect audience for this film. I was laughing steadily throughout in a kind of nostalgic geek reverie. But even if old tech isn't your thing, you've got to admire Bujalski's scrupulous use of in- period cameras and props to so wonderfully create the mood of the time. COMPUTER CHESS has a running time of 93 minutes. COMPUTER CHESS played Sundance 2013 where Andrew Bujaski won the Alfred P Sloan Feature Film Prize "for its offbeat and formalistically adventurous exploration of questions of artificial intelligence and human connections." It also played Berlin, Sydney and London 2013. It opens in the UK on November 22nd.